Taking a nature walk with your kids is a great way to help give them a love of nature. It also fosters a respect for the earth. The great outdoors has a lot to teach little ones. 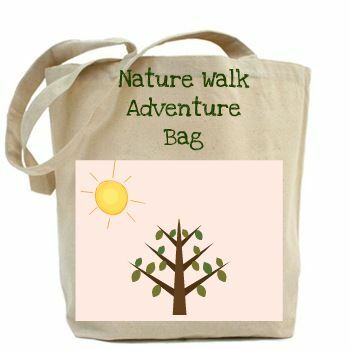 It is a great idea to have an nature walk adventure bag packed and sitting by the door. You can pick up canvas totes at various craft stores, and if you are like most people you may already have one in your home. Have your child draw a picture and scan it onto your computer. Then using iron on paper that you can find at office supply and craft stores print the design and iron it to the front of their bag. field guide books to identify trees, animals, insects etc. It is also helpful for the adults to bring a blanket, in case you decide to relax or have a picnic. If you are going somewhere with water it is good to pack extra clothing or have your child wear a swim suit under their clothing. Our family loves the relaxed afternoons spent at a park, on the beach or somewhere in nature. End the day with a surprise trip to a local ice cream shop! You can find parks to go to on in the U.S. on the National Park Service Website If you are out of the US you can do a search online to find a park or forest in your area. Kids thrive when they get a lot of time outside! They also sleep better at night when they have lots of fresh air and physical activity. This is a way to bond with the whole family. For families that walk their pets daily, having a bag of activities can also entertain your child if they get bored on outings. Did you like the nature walk idea? Find more outdoor fun here!